A Shepherd's Heart: Prayer Is A Gift But Remember: God is NOT Your Personal "Genie in a Lamp". 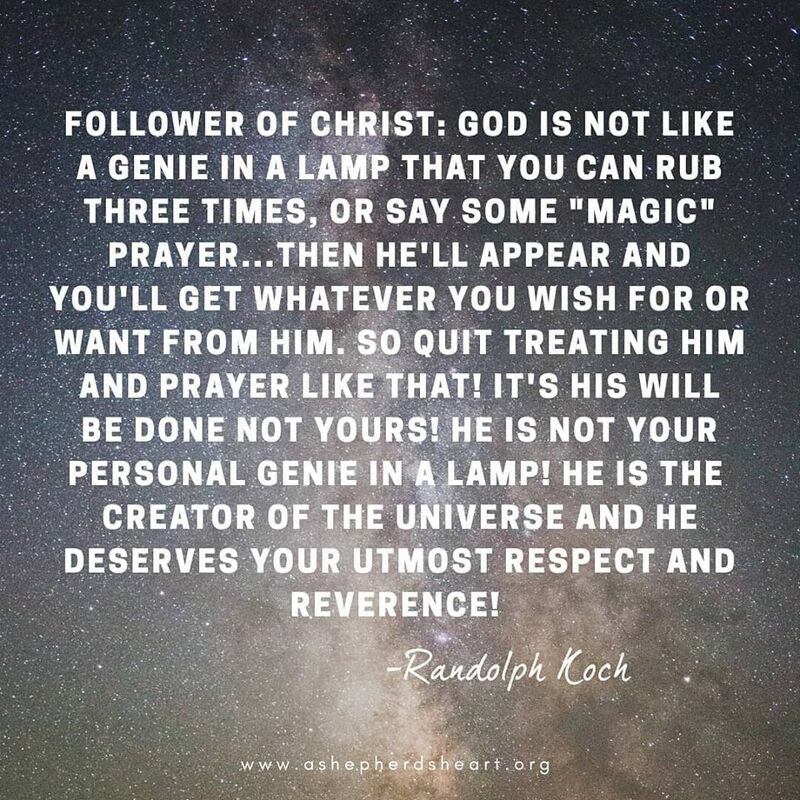 Prayer Is A Gift But Remember: God is NOT Your Personal "Genie in a Lamp". Prayer is a precious gift and vital tool that God has given us. The fact that we can freely talk to The One Who gave us life is amazing and we should never take this gift or Him for granted. As we approach prayer, we need to remember and be encouraged that He's a loving Father Who knows what's best for us and when He instructs us to pray believing in faith and to approach Him with confidence, He really means it. they want?! REALITY CHECK: God does not obey our supposed command! Here's a probably ridiculous example but I think you'll get the point. To set this up, keep in mind that I was a three sport guy (Football, Wrestling, and Track for most of my school years) as well as did fine arts back in the day. In football, I was an offensive and defensive guard and tackle depending on what the need was and if you follow football, that's a lineman position. All this to paint a picture and let's just say I have never been accused of being a small man. Now, lets say I started doing what some people are doing at times expecting that God will give them whatever they want by praying and believing in faith that God would make me someone who is good at "ballet"! I purpose to pray daily, name and claim scripture, pray often that "God would make me good at ballet"...and then He obviously answers NO yet I keep praying and He keeps telling me NO through His Word, through other people who come alongside to give me counsel that I should head down a path that fits me better because they recognize it's not God's will for me. Then hopefully reality hits...I wasn't build for ballet and while you might remotely admire my faith...you'd understand that I probably shouldn't have prayed for that in the first place! LOL...thank you God for not answering that prayer...ok, I've never really prayed for that...but hopefully you get the humor and point. It wasn't His will. In recent years, I've used various social media including prayer apps and I unfortunately see the flawed thinking and behavior like this all too often to the point where people "Name, Claim, Quote and prayer Scripture", etc, with the expectation, again, that He'll be giving them whatever they want. Sometimes people are astonished when God doesn't give them the money, cars, jobs, a relationship with a certain person or whatever they are praying for because they named, claimed and believed in faith. The problem is that they forget It's God's will and there is wisdom that has to coincide with our faith! People also sometimes don't listen to the counsel of people around them and press on because they want what they want and they confuse their desires and will with God's desires and will for them! 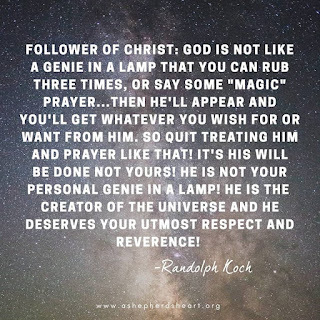 The reality for all of us is that God is not anyone's personal "genie in a lamp" that you can rub three times and He'll just appear and give you everything you ask. Furthermore, you can't say "Magic Prayers", or "Quote His Word" to try to get what you want. No, that's not how prayers works! Now, don't get me wrong...it's not wrong to pray through scripture but, if you heart, mind, and attitude is wrong or you have the wrong motivation...that's where you sabotage yourself! God is not going to honor that. Also, keep in mind that He's not going to bless anything that isn't aligned with His Word! At the beginning and end of it all, we have to have faith and trust in The Lord. We have to have faith that He knows what's best and He hears and will answer our prayers according to His Will. We have to rest in His answer and never try to "coerce" God into giving us what "we want"...as He again, knows what is best...and when He says NO...I hope someday we'll look back and say, Thank you God for not answering that specific prayer the way we wanted Him too! Lay ALL of Your Burdens Down!